Passes to our federal public lands: National Parks, National Forests, Bureau of Land Management, Fish and Wildlife, etc. Owner and passengers in their private vehicle may enter federally managed recreation sites for free. Owners need photo ID to use the pass. Purchase at any visitor center or federal land management agency’s office headquarters (typically requires prior inquiry – call first), or affiliated partners. Purchase at any visitor center, federal land management agency’s office headquarters (typically requires prior inquiry – call first), or affiliated partners. Mail order increases overall price. Current U.S. military members and dependents of deployed military in the Army, Navy, Air Force, Marines and Coast Guard, and most members of the Reserve and National Guard. Need proper identification: CAC Card or DD Form 1173. Purchase at any visitor center, federal land management agency’s office headquarters (typically requires prior inquiry – call first), or affiliated partners. Owner and passengers (up to 3 adults) in their private vehicle may enter federally managed recreation sites for free. Every Kid in a Park – learn more! Mail order only – via online checkout. Awarded to those who contributed over 250 hours of service on federal land. Contact your coordinator for details on obtaining this pass. Every state has their own pass. 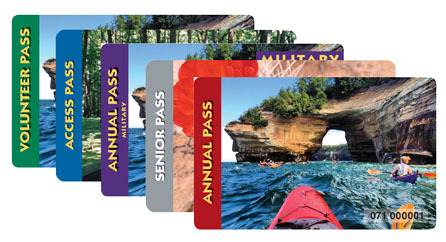 These passes can be less cost effective than an America The Beautiful pass, unless you have a habit of visiting state parks. What is “Leave No Trace” (LNT) and Why Should I Care?